Common Scoter is a seaduck that can be seen round Arran in the winter. While it is not as familiar as the Eider that can be seen round the coast of Arran all year, it is there. In the winter Goldeneye is a regular visitor to our coast as well as fresh water ponds and lochs, but Common Scoter sightings are less frequent. The Common Scoter is far from “common”. The Common Scoter is the only wildfowl species that is Red Listed as a breeding bird in the UK. There are only around 50 pairs left, with numbers having dropped by more than half over the last 25 years, the core of the population being in the extraordinary blanket bogs of the Flow Country in the far north of Scotland. Winter is the best opportunity to see these ducks, tens of thousands appear in UK coastal waters each winter. Although it is not clear where these birds have come from, the Common Scoter breeds across northern Europe and northern Russia, including Iceland, Greenland, Scandinavia and as far east as the Olenek River in Siberia. Outside of the breeding season, the Common Scoter moves south to spend the winter along inshore coastal waters of western Europe and western North Africa, from Norway south to Mauretania. 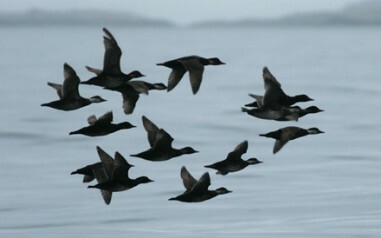 A large proportion of the Common Scoter population overwinters in the Baltic Sea. In Arran coastal waters last year there were seven reports of Common Scoter from two locations with twenty off Cosyden from 2nd to 10th December being the largest group. This is fairly typical reporting of Common Scoter on Arran in recent years. 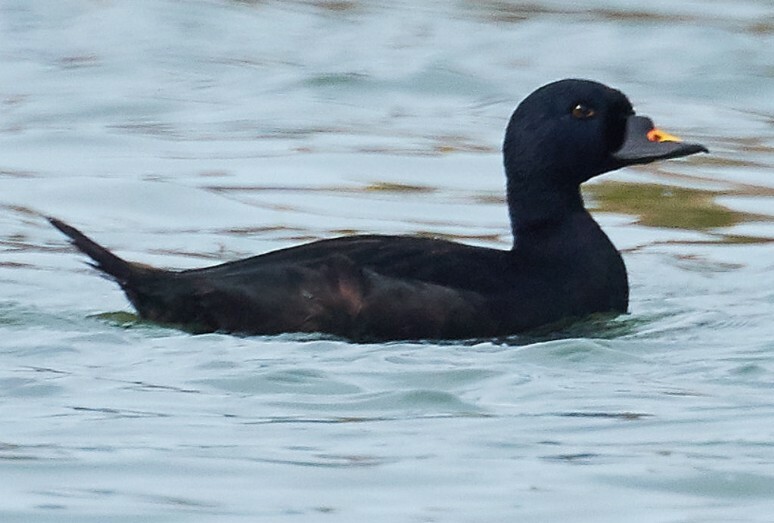 The systematic name of Common Scoter is Mellanitta nigra. The word nigra, comes from the Latin for ‘black’, and refers to the entirely glossy black plumage of the male. As well as entirely glossy black plumage, the beak of the male Common Scoter is also black, with a swollen black knob at the base and a conspicuous patch of yellow on the top. In contrast to the male, the female Common Scoter is dark brown, with a darker crown which contrasts with the pale sides of the head and neck. The female Common Scoter has a dark brownish to black beak and is also slightly smaller than the male. 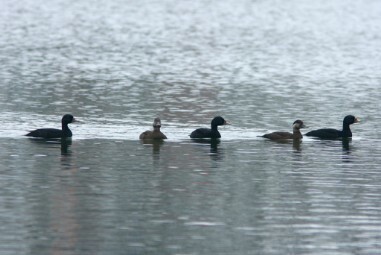 Juvenile Common Scoters are similar in appearance to the adult female. The diet of the Common Scoter consists mainly of molluscs, particularly mussels. However, this species will also eat other invertebrates, such as shrimps, worms and insects, as well as small fish, fish eggs, and some plant matter. The Common Scoter usually catches its prey by diving underwater. The Common Scoter swallows mussels whole, crushing their shells in its gizzard. This seaduck species typically dives with a short forward jump, with its wings closed tightly to its body. Flocks often surface dive together. The Common Scoter is a highly sociable species and is often seen in flocks, particularly during the winter where they form bobbing rafts offshore or long straggling lines flying along the coast. Look out for small flocks of Common Scoter on the sea round our coast this winter.